Australian Poetry is thrilled to be partnering with literary journal The Lifted Brow to present the panel discussion Blak Brow: Black Women Take Control at the Carriageworks Studio on Saturday 4 May at 3pm as part of the Sydney Writers’ Festival. Aboriginal women have got a lot to say and need platforms to say it – and they say it better when Aboriginal people are in control. 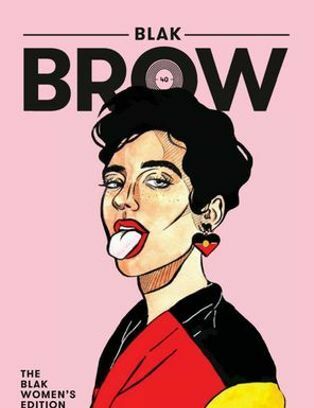 Blak Brow is a special edition of The Lifted Brow celebrating, sharing, platforming, respecting and listening to the diverse voices of First Nations women through poetry, art, illustrations, fiction, non-fiction and interviews. The Blak Brow is the result of handing over control of The Lifted Brow to a collective of Aboriginal writers and editors. Join Evelyn Araluen as she speaks with Paola Balla, Kim Kruger and Vickie Roach about the dynamic lives, concerns and aspirations of Aboriginal women and by extension, their communities. Paola Balla is a Wemba-Wemba and Gunditjmara woman. She is an artist, curator, writer, lecturer, and Lisa Bellear Indigenous Research Scholar PhD candidate on Aboriginal women’s art and resistance at Moondani Balluk Indigenous Academic Centre, Victoria University. She co-curated Sovereignty and Unfinished Business, perspectives on art and feminism at ACCA. She has written for Artlink, Writers Victoria, The Lifted Brow, Frieze UK, Peril Magazine, and is a member of the Blak Brow Collective. V ickie Roach is a writer, a poet, an activist and an advocate for women (particularly Aboriginal women) who have been caught up in the criminal justice system. Vickie participated in the 2007 High Court challenge that succeeded in striking out Howard government legislation banning prisoners serving three years and under from voting, and in the same year was the joint winner of the Tim McCoy Human Rights Award.